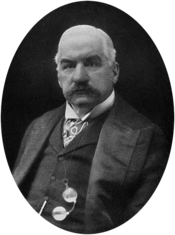 John Pierpont Morgan was born in Connecticut in 1837, to the New England version of the aristocracy. His father, Junius Spencer Morgan, was a wealthy trans-Atlantic banker who enrolled his son Pierpont (as he was called) at the best private schools, and at universities in Switzerland in Germany, before taking a position at one of the Morgan banks in London. Throughout the second half of the 19th century, J.P. Morgan gained power as a crafty financier involved in several industries and banks. During the Civil War, J.P. Morgan paid $300 to avoid serving his draft status in the Union Army, while serving instead as a bank-roller and war-profiteer. There was an incident, for example, in which he was responsible for the sale of 5000 defective rifles for a large profit, which was investigated by the government. Unsurprisingly, there were no charges brought against him. In contrast with the diverse group of infamous monopolists and ‘robber barons’ such as Commodore Vanderbilt and Jay Gould (railroads), John J. Rockefeller (oil), and Andrew Carnegie (steel), J.P. Morgan was primarily a money-man–that is, an investor of capital rather than an industrialist. In the many conflicts between the nascent railroad and oil industries for control of resources and land, J.P. Morgan showed that the next stage in the development of capitalism was the represented by the power of finance. In the case of the railroads, he could see that the suppression of competition was the most efficient and profitable course of action, and every deal he made multiplied his profits and control over other capitalists. The watershed moment in this history came in 1901, when J.P. Morgan bought out Andrew Carnegie and took control of his steel empire, reorganized it as the US Steel Corporation. Carnegie, who was a self-made man and a pure manufacturer rather than financier, sold for $400,000,000 and became the richest man in history. He spent the next 18 years giving away 90% of his wealth to education, libraries, scientific research, and world peace. J.P. Morgan, on the other hand, became the head of the world’s largest, and first Billion-dollar, corporation. US Steel was actually worth $1.4 Billion, and it now controlled a majority of American steel production. This, however, was only one of J.P. Morgan’s diverse business interests. The power he amassed through his monopolistic policies in steel, railroad, banking, and other ventures like newspapers, livestock, and ocean liners, was enough to make him arguably the most powerful man in the world from 1901 to his death in 1913. He was received as a king by Edward VII, Kaiser William, and the Pope. In the Panic of 1907, J.P. Morgan arranged a deal to single-handedly bail out the U.S. government and restore confidence in an economy in crisis. This almost directly led to the Federal Reserve System of 1913, in which politicians and rival bankers wished to prevent one corporation (in this case, one man) from having so much power in the future. In addition, public opinion gradually turned hostile to J.P. Morgan after 1901 due to his anti-competition, monopoly-building practices, and he was often at war with Trust-busting Progressive leaders like Theodore Roosevelt. Upon his death, this erstwhile king of finance was succeeded to the throne by his son, J.P. Morgan, Jr. His biggest claim to fame came immediately as World War I broke out, when he began financing the governments of Russia, England, and France. J.P Morgan Jr.’s extensive dealings, especially his favoritism towards England, surely played no insignificant part in escalating the war, drawing the U.S. into that destructive and absurd conflict on the side of the Allies, and continuing the Morgan family tradition of war-profiteering. Post-war, J.P. Morgan, Jr.’s notable accomplishments include financing Germany’s unfair reparation payments of the Versailles treaty, giving Mussolini a $100,000,000 loan prior to the Second World War, and fighting tooth-and-nail against President Franklin Roosevelt’s New Deal plan. Fortunately, he was largely unsuccessful in this last endeavor, and many much-needed financial reforms and regulations were enacted in the wake of the Great Depression. One of these pieces of legislation was the Glass-Steagall Act of 1933. One of the main provisions of this Act was the forced separation of commercial and investment banks, which helped to mitigate risk to the national economy due to under-regulated banking conglomerates. Though this Act was imperfect and obviously not a panacea, it represented a positive step towards achieving a better balance of government regulation and free market enterprise. Naturally, it was gradually circumvented and undermined by a series of the “smartest bankers” of the day, who realized that new generations of politicians could be bought and controlled just like the old ones. Despite 50 years without a financial crisis after the instatement of the Glass-Steagall Act, the weakening of regulation by the time of the Reagan-era 1980’s led once again toward the dangerous path of the consolidation of banking power, along with increasing risk of meltdown. After the formal repeal of the Act in 1999 by Bill Clinton, it was only 7 years before the nearly-fatal event occurred. By 2000, JP Morgan & Co. was back in full force, merging with Chase Manhattan Bank to eventually become the largest bank in the United States by assets, and the largest public company in the world (as of 2011). This is the context in which we find this venerable institution leading the way in the next round of financial wizardry at the public’s expense. How do we feel about this, the “best managed bank there is,” still fighting against needed reforms that will keep its dangerous power in check? Should it be left to its own devices, as CEO Dimon says, or should it, and all similar institutions be broken up so that they cannot willfully cause another meltdown? I think the answer is self-explanatory. An easy step to take is mustering public opinion toward a reinstatement of an updated Glass-Steagall Act which will force the separation of commercial and investment banks (there are many online petitions calling for this exact thing, and a few progressive politicians leading the way). Likewise for a strengthening of the recent, but too weak (due to immense lobbying pressure from Wall Street), Dodd-Frank Financial Reform Act. In addition, income from financial investments should not be singled out for a preferential tax rate of 15% but should be taxed as any other income. Also, there should be some sort of public ownership and control over at least a part of the enormously powerful financial machine that has been created since the days of the original J.P. Morgan. The rich will still be rich, and no one faults them for that, but they will be prevented from amassing and exerting the type of power which tends to happen when they are given special political privileges. Then, we will have a healthier, less risky, and more sustainable balance of regulated capitalism where many can succeed, and more equal democracy for all. I have to say this is indeed a very interesting post. The end part arguing for reforms is one I support even though I live in the UK. Unfettered power, such as banking, in private hands is dangerous on a global scale. Of course unfettered trading full stop, in my opinion, is also dangerous to global well being. I’m happy to see we seem to share the same opinion on the matter. In the quote you cited, there is no doubt of the accuracy of the first part regarding J.P. Morgan, Jr.’s financing of those countries and his favoritism towards England. The basic facts and numbers can be found in a number of encyclopedia entries. The second part is basically my own value judgment and interpretation, which cannot be proved, and thus is personal speculation rather than fact. All the facts point me to the belief that this most powerful banker in the world financing $1.5 Billion towards England and France, and his huge influence with US politicians, played no small part in how the war played out on a financial level. I also took some information in these cases from Bertrand Russell’s 1934 historical study entitled Freedom and Organization, as well as an article from 2000 by Martin Horn in the Business History Review. I certainly do share the same opinion as yourself. It is time we all woke up to the dangers. Thanks for explaining your reasons behind the statement as well and I can understand your reasons.